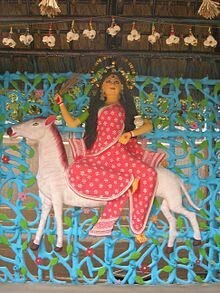 Sheetla Mata is worshiped in whole rajasthan and most of Northern state of India. The two main place are dhanoop in Bhilwara and Sheel-ki-Doongri Jaipur. Dhanop is a little village near Bhilwara with only the Sheetla Mata Temple to boast of. But it makes for an interesting visit as it's the brightest temple around. The walls and pillars are bright red while the roof is shining white. The floor is of marble, and a checkered one at that. In the composite is a neem (Azadirachta indica) tree which looks more like a Christmas tree. This is because of the hundreds of colorful pieces of cloth which devotees have tied around its branches in the belief that it will fulfill their wishes.